Welcome to Properties of Matter. Here you'll begin an amazing journey into the world of chemistry. start learning the names of the chemical elements! Watch the first video below to learn the original song Modern Major a general. Then watch the two parodies below. You can google search the lyrics to the Elements Song by Tom Lehrer to. Learn the first verse by Monday. ! The pH scale is a measure of how acidic or basic a substance is. The numbers run from 0 - 14, with strong acids closer to 0(zero) and strong bases closer to 14. 7 is neutral. Pure water is 7. When acids and bases are mixed together, they neutralize each other. Each student will research an element and present some basic information about their element to the class. The presentation can be in the form of a poster, pamphlet, PowerPoint presentation, song, poem, or other. You must “present” your project in front of the class. The presentation should be 2-3 minutes long. You will hand in a printed copy of your presentation to be graded. Slide 3 - What is its group number on the periodic table(column)? - How many electrons are in it's outer shell? - Which other elements are also in that group? What properties are common to that group? Slide 4 - What/where/whom it is named after, what language the name comes from? Slide 6 - Sources: where do we find it? - How do we get it? - Is it usually combined with another element? Which combinations? 2-17-15 Tuesday. Read pages 64-65 "Lesson 7: Just a Phase" in the Properties of Matter Student Guide. Answer questions A-F on page 65, using a sheet of paper to hand in. Make sure your paper has your Homeroom, Assignment, Name, and Date on the top. This is a team assignment, so put each team member's name on the paper. Hand in only 1 paper per team. When finished, read through the lab on pages 66-67 in the Student Guide so that you are prepared when we do the lab. 1) Define conservation of mass in terms of phase change and dissolving. All matter can be classified into two categories: pure﻿ substances﻿ and mixtures. Let's be clear... O, O2, and O3 are all made from the same element: Oxygen. We just don't ever find Oxygen as a single atom, O, in nature; we always find Oxygen bonded to something else (O2, O3, H2SO4, etc.). The oxygen we breathe in is the compound O2. Pure substances can not be separated by physical means. You can't reach in with a microscopic pair of tweezers and pluck out an O from H2O. Mixtures are made of two or more substances that are NOT chemically bonded together. If the mixture is poorly mixed, meaning you can easily see the different parts of the mixture, it is called a heterogenous mixture (pronounced het-er-o-jeen-us). Hetero = different, genous = kind). Examples: cake, cereal, sand&water. If the mixture is so well mixed that you can't tell the difference between it's parts it is called a homogenous mixture (homo means same). For the video "Discovering the Elements" click here. What are things made of? The simple answer is "matter." Most matter we think of is made of really tiny particles called atoms. Atoms are so small we can't even see them with our most powerful microscopes. It wasn't until the 1800's that we even knew they existed. If you can taste it, touch it, smell, breathe it in, or drop it on your foot, it's matter. All matter has a characteristic property called mass. Mass is a measurement of both the size of and number of atoms in a material. Example: 100 gold atoms is more massive than 100 hydrogen atoms, because gold atoms are much bigger than hydrogen atoms. The unit for mass is called the gram (g). In class, you will use an electronic balance to measure mass. (example: 27g, 300.7g). Mass, like we learned above, is a measurement of how much matter is in an object. It doesn't matter if you are standing on Earth, the Moon, Jupiter, or floating out in space... you are still made of the same amount of matter (you haven't lost or gained any atoms). Weight, however, is a measurement of how much the force of gravity pulls on that matter. The Moon has less gravity than the Earth, so the Moon's gravity pulls you down less; result: you weigh less. Jupiter has much more gravity, so it pulls you down more; result, you weigh more. Out in empty space their is no gravity, so you are not pulled down at all; result: you are weightless! Another fundamental property of matter is that it takes up space. The amount of space matter takes up is called volume. The nit for volume is the liter (L). However, in our class we measure relatively small volumes, so we'll use small units like milliliters (mL) or cubic centimeters (cm^3). Don't get confused, 1mL = 1cm^3, so you can use either unit. A milli-liter is one-thousandth of a liter; it would take 1000mL to fill a 1L bottle. Let's say it again: a cubic centimeter is a milliliter. A milliliter is a cubic centimeter. 7mL=7cm^3. 25cm^3=25mL. Cubic centimeters and milliliters are the same thing. Any questions? 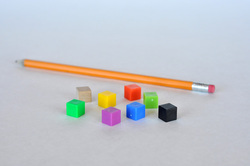 The volume of regular shaped objects like pyramids, spheres, and blocks can be measured using a ruler and a little math. Blocks are simple; just use the formula: L x W x H.
Since liquids have no definite shape, a ruler won't work to measure a liquid's volume. Instead, scientists use a graduated cylinder. Just pour the liquid in and read the measurement on the side of the cylinder (in mL). Put some water in a graduated cylinder (don't fill it all the way), write down the volume of the water. 1. Volume of water = 80mL. 2. Volume of water + object = 100mL. 3. 100mL - 80mL = 20mL. The volume of the object is 20mL. When you compare a material's mass to its volume you discover another characteristic property of matter: density. Density is defined as mass divided by volume (D=M/V). Since the unit for mass is the gram(g) and the unit for volume is the cubic centimeter (cm^3), BOTH units are included in the unit for density: grams per cubic centimeter (g/cm^3). Example: a small block of iron might have a mass of 16g and a volume of 2cm^3. 16grams divided by 2 cubic centimeters equals 8 grams per cubic centimeter. Characteristic properties are properties that can help us identify things. Human characteristic properties might include hair and skin color, height and weight, face shape, and even speech patterns. 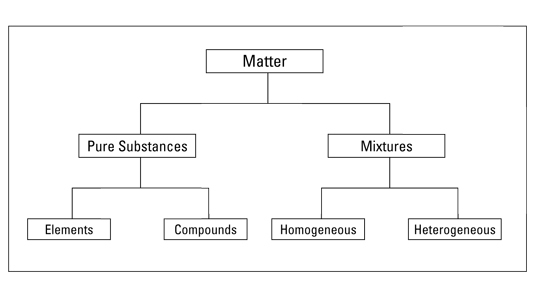 The density of a substance is a characteristic property of that substance. Therefor, density can be used to identify what a substance is made from. In the density example above we found that iron has a density of 8g/cm^3. An iron railroad spike, an iron fence railing, and an iron cannonball all have different masses and volumes, but they share the same density. It doesn't matter how much or how little iron you have, its density is always 8g/cm^3. If we break off a small chunk of the cannonball, the small chunk and the cannonball still have the same density, because they are both made of iron. Less dense materials float on top of more dense materials. As long as there are fluids (liquids or gases) involved, materials will layer themselves based on their densities. Cold ocean water is more dense than warm ocean water, so the cold water sinks to the bottom. All materials expand when they are heated. Why? Heat is energy. Think about your own energy levels. When you have more energy you can move faster, but when you have low energy you move more slowly. Remember that matter is made of atoms and those atoms are always in motion. In solid objects, atoms are locked in place, but still have a little bit of motion; they vibrate or jiggle around a little bit. When a material gets hot, its atoms are gaining energy. The hotter a material gets, the faster its atoms move, and the further they can spread apart. Check out the video below (Ring and Ball Magic?) to see a classic demonstration of this. In the video to the left, a metal ball cannot fit through a metal ring because the ball is too big. The metal ring is then heated, which expands the size of the ring (its atoms speed up and get farther apart), allowing the ball to pass through. In the video to the right (Spanish, Portuguese? ), an aluminum bar is heated with a flame. The bar is anchored with a vice on the left so that the bar can only expand to the right. The bar only expands slightly, so to help see the effect, a needle attached to a straw is placed under the bar. As the bar expands to the right, it rolls the needle (which turns the straw). When a material is heated it expands (its molecules get farther apart). That means the material now takes up more space (volume) than it did before. Since the density of a material depends on its mass AND its volume, any change in volume will change the material's density. Note that the mass doesn't change. You haven't added or taken away any atoms, it's still made of the same "stuff." If you've ever been swimming in a lake in the summer, you've probably discovered that the warmer water floats on top and the colder water sinks to the bottom. That's because warm water is less dense than cold water. Write your answers using full sentences. A substance has a mass of 157.4g and a volume of 20cm^3. 1. What is it's density? 2. What is the material? 3. Will it float on water? A substance has a mass of 10g and a volume of 8mL. 4. What is its density? 5. Will it float or sink in water? 6. This is most likely which substance? 7. Which is more dense, water or sea water? 8. Why is one of these more dense than the other? In science class, you measure the mass of a gas to be 0.5g and its volume to be 2,300mL. 9. This is most likely which substance? "Lignum vitae" is a wood from the guaiacum tree in the Bahamas. You measure a block of Lignum vitae and find it measures 5cm x 2cm x 5cm. When placed on a scale, you see it has a mass of 61.5g. 10. What is it's density? 11. Will this wood float in water? 12. Which is more dense, oak or lignum vitae? 13. 38mL is equal to how many cm^3? 14. 71cm^3 is equal to how many mL? 15. Which method would you use to measure the volume of a house key? 16. What is the density of 10cm^3 of gold? 17. What is the density of 20cm^3 of gold? 18. According to the graph for the density of aluminum, as the mass increases what happens to the volume? 19. A mass of 15 grams of aluminum will take up how much space? 20. 12cm^3 of aluminum would have how much mass? 3. 1.25g/cm^3. Sinks in water. Glycerol. 4. Sea water is more dense. It has salt dissolved in the spaces between the water molecules. Because seawater has more "stuff" in the same amount of space, it is more dense. 11. They are both the same. 19.32g/cm^3. Density is a characteristic property of matter. It does not matter how much or how little gold you have. The density of gold is always 19.32g/cm^3. To remove the air from the bottle, we'll use a special stopper that only allows air to move in one direction... out of the bottle, not in. We saw before that solids, like the metal ball and metal ring in the video on this page, expand when heated. Liquids do this too. A common experience with expanding liquids is a thermometer. As the liquid inside the glass heats up the liquid (usually an alcohol) expands. Since the glass prevents the liquid from expanding outwards or down, there's only one direction for the liquid to go... up the tube! The metal strip in this video is actually made of TWO metals (brass and steel) that have been bonded or "glued" together. Since brass expands much faster than steel, when the strip gets heated, the brass stretches out in all the directions it can. Can you imagine running a three-legged race with someone who runs much slower than you. As the two of you run, you'll constantly be pulled in the direction of the slower person.